2018 Dean's Scholar, Benjamin Franklin Scholar and ’18 College graduation speaker Helena Von Nagy is a double major with studies in Theatre Arts and Political Science. She was featured as Helena in the fall 2017 Theatre Arts production of All's Well that Ends Well directed by Professor Cary Mazer and is the recipient of the 2017/2018 Cabanne C. Smith Undergraduate Research Award. The Cabanne C. Smith Undergraduate Research Award is administered through the College of Arts and Sciences and provides a maximum $1,000 prize to the winner. Theatre Arts offers the opportunity for honors thesis projects in both academic and practice-based topics. 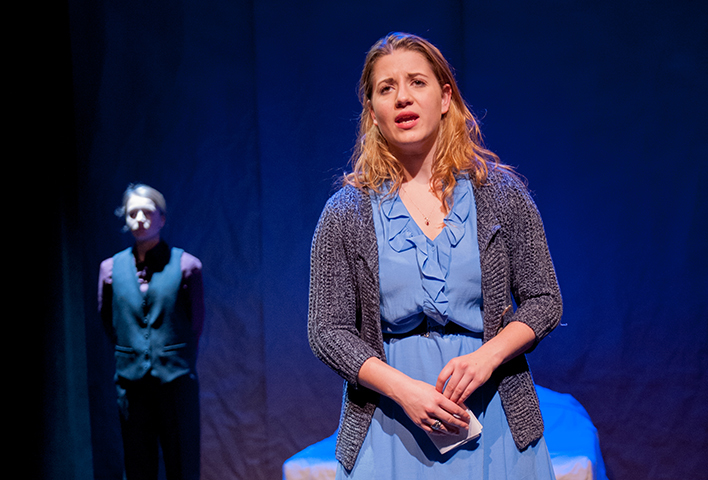 Recent honors thesis projects include topics in acting, directing, design and dramaturgy. Professor Cary Mazer describes Helena von Nagy’s honors thesis as “an exemplary acting-thesis essay, tracking the actor’s journey from the moment she was told what her thesis role was going to be, through rehearsals, until the production’s end, mapping the emergence of her interpretation against the progress of the character across the span of the play, from the character’s initial misunderstood silence in the first scene, to the production’s unfixed and improvisational staging of the play’s ambiguous ending. Helena successfully grapples with the play’s problematic production history and dubious interpretations of her character through the centuries, even among the character’s many scholarly admirers, discovering for herself the character’s sexuality, autonomy, assertiveness and improvisatory skills, until the actor and the character arrive together at a surprisingly liberated conclusion. Helena’s thesis will no doubt serve as a model for acting-theses in the years to come.” We caught up with Helena during spring break to get her thoughts on Shakespeare, intersections between theatre and political science and theatre in university life. Your Theatre Arts Honors Thesis project will draw from your Fall 2017 production experience in Shakespeare's All's Well that Ends Well, directed by Dr Cary Mazer of the Theatre Arts Program. Did you have prior background with Elizabethan drama, and what was it like to work with a Shakespearean scholar as a director on this production? My first foray into theater in middle school was actually a Shakespeare production, and I’ve stuck with Elizabethan theater ever since. I’ve performed in Romeo and Juliet, As You Like It, Macbeth, A Midsummer Night’s Dream (twice), The Taming of the Shrew, Twelfth Night, and (now) All’s Well that Ends Well. I also spent three weeks at Shakespeare’s Globe Theater a couple summers ago on a special Shakespeare performance course. Cary was an absolute dream to work with. It was really great to work with a Shakespearean scholar on a production, because we could nerd out in the middle of rehearsals and go off on tangents, comparing this play to that other play and referencing Shakespeare’s other comedies to work through dynamics in scenes, and quoting a lot. We quoted A LOT of other plays. It just made the whole rehearsal process fun. He, also, of course, just brings so much knowledge into the rehearsal room that really helped me work through scenes. He understands how the language should be used, and what the wordplay means, and the implications of certain poetic tricks. I learned so much from him. You are a double-major in Theatre Arts and Political Science. Have you found surprising connections between these studies? Do you envision a path after graduation that might draw on both degrees? I have made a point of focusing my political science studies on the implications of political theater (both the performative aspects of performance and the role of theater in politics and political movements). I was in a poli-sci seminar on Shakespeare and political thought, where we looked at how political theories play out in Shakespeare’s plays. I ended up writing on how Shakespeare subtly suggests the need for what we now understand as republican democracy if you put Richard II, Henry IV, King Lear, Hamlet, and Julius Caesar in conversation with the philosophies of Machiavelli and Hannah Arendt. I’m currently also writing an honors thesis in political science about the role of Shakespeare in recreating ideas about democratic citizenship in Mexico and Argentina after calamitous political events. Furthermore, my graduate work in political theory next year will focus on the role of Shakespeare’s sin advocating for human rights around the world, looking at how Shakespeare is used and transformed in the non-English speaking world to make political arguments about individual rights and also how Shakespeare served as a philosophical actor in his own time, inspiring enlightenment philosophers like Hobbes and Locke who would go on to coin the term “the natural rights of man,” which is the basis of human rights law in the world and we understand it now. There’s a great book Theater and Human Rights that was just published, I think last year, that expands upon this first idea and looks at theater all over the world and its role in political protest and human rights discourses. So, yes! My path after graduation definitely will draw on both degrees. What do you think the value of studying theatre is to today's university student? For the non-theater student, there are MANY benefits. I mean, theater is one of the oldest art forms, since it really is just a kind of make-believe storytelling, and it’s stuck around, so that should tell you enough. First, you learn about narratives, storytelling, and public performance, which are skills that will come in handy if you ever make a speech or give a presentation in your life, which will most definitely happen. Second, live theater captures the emotions of whatever decade/century it was written in with a kind of depth, urgency, and intimacy that, I think, you don’t necessarily get from other forms of literature or art, simply because of the way the medium is constructed. Theater relies on the power of having another human present a narrative. So, studying theater gives you a really potent vision of the past. You also see how humans react, think, and rationalize their world. It’s also a nice break. It teaches you different ways to think, so you use your brain in a way you wouldn’t in your other classes. If you’re a student of the sciences, you learn to understand more subjective arguments; if you’re studying some other form of the humanities, you start to learn more about aesthetics of performance and design; if you’re an art student, you get a more literary approach and a different medium of art.